Yes, astronauts landed on the moon. But that doesn't mean NASA has been completely honest. 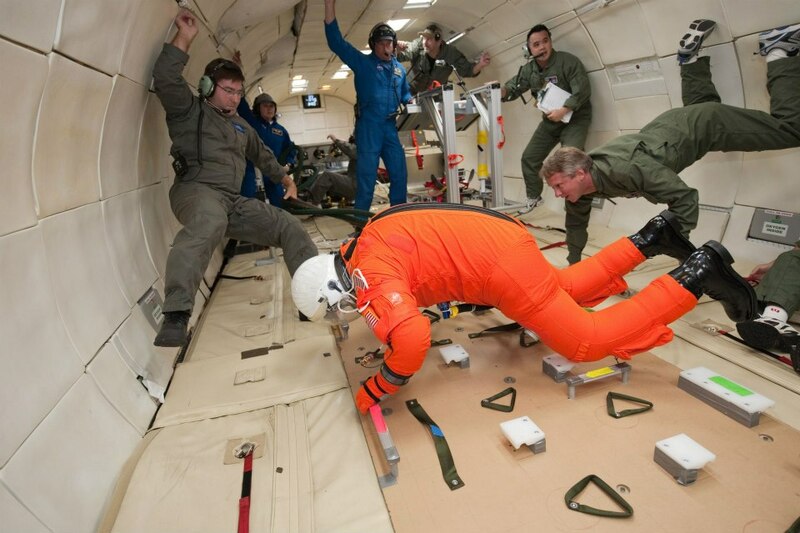 Free fall aboard NASA's vomit comet, where gravity is anything but micro. Starting in the 1970's, for some reason I have yet to discover, NASA started lying to us about the basic physics of space flight -- that is, they invented the word microgravity. OK, maybe they didn't invent it. I'm not sure if it's possible to figure out exactly who coined the term. Still, some time in the late seventies or early eighties, NASA (and a lot of other scientists) enthusiastically embraced the the idea of microgravity. The problem is, NASA is using it wrong - and I believe that's a very bad thing. Microgravity is a perfectly fine term, if a bit vague, in some circumstances. If you accept the somewhat egocentric view that the gravitational force we experience standing on the earth is the benchmark, and that the term micro is the prefix for one millionth, then microgravity a million times weaker than our gravity does exist when you are very far from massive bodies like the Earth and Sun. By that definition, these folks are not in microgravity. 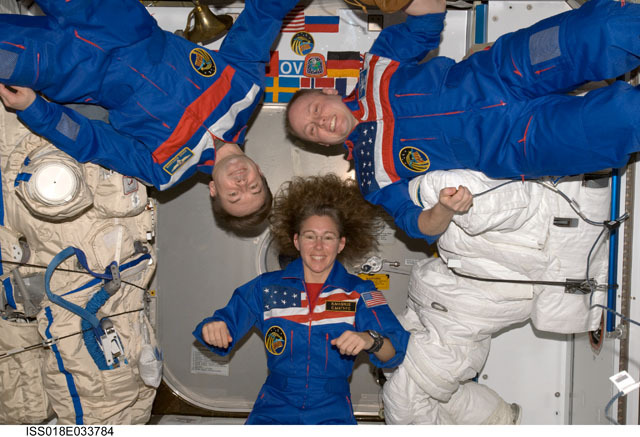 The picture was taken when these astronauts (who are oddly unidentified in the NASA stock photo I found) were aboard the International Space Station. As NASA points out on their microgravity information web page, the acceleration due to Earth's gravity at the ISS is about 90% of what we experience on the ground. In other words, people on the ISS are existing in something much more like gravity than microgravity. Maybe, what NASA means by microgravity is that the astronauts are weightless - except that is as wrong as saying they are in microgravity. Weight is the force acting on an object that is the product of the object's mass and the acceleration due to gravity. So a hundred pound person on Earth weighs about ninety pounds on the ISS. No, you can't put them on a scale to measure that weight. That doesn't mean they're weightless, it just means scales are the wrong instruments to use to weigh people in orbit. If not Microgravity, Then What? Astronauts and everything else that isn't tied down on the ISS appear to float about not because they are in "microgravity" or even small gravity (as NASA prefers to define micro). Nor are they floating about because they are "weightless." They aren't actually floating at all. They are falling. You can experience the very same thing, briefly, by jumping in the air. Are you momentarily experiencing microgravity before you come crashing back down? No. Has your weight changed? No. You are, however, in free fall. As are the ISS astronauts. They just get to fall for a much longer amount of time. Once upon a time, free fall was in fact the accepted term for what many people now (completely erroneously) call "microgravity." Free fall also happens to be completely correct, from a physics point of view. So why did NASA abandon a perfectly good, scientifically reasonable term and replace it with a nonsensical word? I wish I knew, but I'm guessing it was an attempt to make things sound more sciency. What Difference Does it Make, It's Just a Word? Why does it matter? Because, dagnabit it, words are important. They can help teach and provide insight, or they can mislead and do real intellectual harm, as I feel is the case with "microgravity." As NASA uses it, microgravity implies several things that are fundamentally at odds with basic, high school level physics. It flies in the face of the inverse square law of gravity. It devalues a very useful and scientific prefix. It hides the connection between everyday experiences (bouncing on a trampoline, riding a roller coaster, throwing a baseball) and the awesomeness of orbiting the planet in perpetual free fall. When a child asks "why do astronauts float in space?" if you answer "because of microgravity," instead of "because they are in free fall," you have missed an opportunity to teach them something about both space and the world around them. Instead of planting a beautiful seed of knowledge, you have given them a meaningless bit of utterly useless nonsense, at best. At worst, you've taught them something their future physics instructor is going to have to unteach in high school. I'm sure you don't tell kids rain is the tears of angels, or the moon disappears each month because a giant monster is eating it. Why tell them that astronauts float because they are in microgravity? Why not just tell them the truth and say because astronauts are in free fall? I think the term originated to describe the experiments being conducted in effectively wieghtless conditions, specifically on granular materials, colloids, fluids and other systems where gravitational forces on earth could alter/mess up the results. The term microgravity is also used when describing experiments done in drop towers and parabolic aircraft flights as well, and is a pretty compact way of saying 'this experiment was done in an accelerating reference frame that effectively canceled the gravitational force due to the earth'. While the force between an astronaut and the earth may hardly change, there is nothing wrong defining the weight of something relative to your own reference frame (replace g with g_eff or something like that). According to a one paper I found on colloidal crystallization (Tsuchida et al. Colloid Polym. Sci., 278:872-877 (2000)) on the space station g_eff is about 10^(-3) x g. Ok, so maybe a slight abuse of the prefix 'micro' but hardly a hoax. Thanks for the comment, but I have to say, no human or experiment in the foreseeable future is going to a true microgravity environment. What they experience aboard the ISS is simply free fall. I see no need to complicate things by comparing it to a distant and nearly inaccessible environment, when we have perfectly good ones right nearby. Drop towers and parabolic flights are really providing environments that literally define what free fall is. If anything, drop towers and parabolic flights could be said to provide brief simulations of an orbiting environment, but again, why complicate it. They are all examples of free fall. Now that I think about it, the gravitational attraction that exists *between two astronauts* in free fall near each other might be on the order a trillionth of the force of gravity they'd feel on Earth (I did that in my head so I might be off by many orders of magnitude). So they might be experiencing a picogravity attraction to each other. It would probably be swamped by static charge, air drafts, and such things, making it undetectable to humans and most measuring instruments. Microgravity, though? Nope. It depends on what you mean by 'true microgravity'. If you blacked out the windows on the ISS and never let the astronauts out (or told them where they were), then by the equivalence principle there is no experiment they could do (at least as far as gravity is concerned) that would tell them whether they were in free fall (or close to free fall) or had been moved hundreds of thousands of miles from the earth (and other large masses). It's just like the way people frequently talk in terms of the equivalent gravitational force when putting stuff in a centrifuge (ie spun at 1000g for 10min or whatever). Of course they could just work in terms of the radius and and rotation speed, but saying '1000g' more compactly conveys the relevant information (at least as far as the stuff in the centrifuge tube is concerned). Maybe micro-g would be a better term? This isn't just being pedantic, it's being pedantic to the point of actually obscuring the relevant physics. I don't think you know how to use the word 'pedantic' properly. Yes, microgravity and micro-g are terms that obscure the relevant physics. Is that what you mean? Talking about the equivalent gravitational force of a centrifuge doesn't imply *anything* except that the forces are compared in strength to a familiar force - i.e. gravity. If you were to call it a *megagravity* environment, then you would be confusing things as badly as microgravity confuses the situation that is accurately called free fall. I don't know about the origins, but "free fall" can be used in every place where "microgravity" is used. Microgravity is only strictly correct in places so far from Earth the no human and nearly no human made object will ever go to them. Free fall is strictly correct whether you're jumping on earth, in orbit , in a drop tower or on your way to Mars. What's wrong with using the true term instead of the jargony, generally false one? While reading this article I was thinking "and I thought I was pedantic." Well, I am indeed pedantic, but I'm not quite so stubborn that it keeps me from learning new things when what I've known before is wrong. Words do mean things, and as Humpty Dumpty explained to Alice, they can mean whatever the speaker means by the word. Popular meanings change with time, and "popular meanings" that persist become actual meanings. Electrocution was once a form of carrying out Capital Punishment, then it came to include accidental death by electricity, and most recently it has come to mean injured but NOT killed (!) by electricity, thus one hears "I was electrocuted." Microgravity may well have been the wrong technical word to use at the time (I would like to have asked the late Robert L. Forward about this), but after all these decades of use in this context, it's now the "accepted word" for what astronauts experience in orbit and in other zero-gravity situations such as the Apollo moon flights (in which they are, pedantically, orbiting the Sun along with the Earth-Moon system). The problem here is it's not just a reasonable evolution of words, it's that there are two terms for the same thing. One is clear, simple, accurate and insightful. The other is a puffed up, two dollar bit of nonsensical jargon. I can't think of a worse example of this sort of thing. There is simply no excuse for it. Just the fact that people have been abusing physics and the language with the word microgravity for forty years is a pretty pathetic reason to keep using it. Microgravity is just a pretentious word for free fall. If you must be pretentious, you might as well be accurate - how about "caduta libera" instead of "microgravity?" It's Italian for "free fall". That would allow people who use it (at least those aren't in Italy ,anyway) to be maximally pretentious and correct at the same time. I'd rather be pedantic than pretentious any day. Wouldn't "hypo-acceleration" do the trick? Nope, hypo- means "below" and the object is still accelerating towards the object applying the largest gravitational force on it. The most important aspect is that the object is free-falling. Gravity is the only force it's experiencing. This is a topic that has bugged me for years! Thank you for addressing it. Would it qualify as microgravity at the Lagrange point where the earth's and sun's gravity cancel out? Well, if we're going to be particular about our words, can I ask why it's the "Intentional Space Station"? It's not just that it is a comparable in strength to gravity, it is that the physics of being in a gravitational field and being in the right accelerating (non-inertial) reference frame are equivalent. That allows you take any results you have describing sedimentation or buoyancy or whatever in your bench-top experiment aboard the ISS and replace actual gravity g with whatever g_eff your experiment experiences thanks to being in free fall. If you are talking about orbital dynamics, then yeah, don't say microgravity. But if all you care about is what's going on in your experiment aboard the ISS, then being in 'true microgravity' and being in free fall are completely physically equivalent. You could try to force people to write papers about 'colloidal crystallization in free-fall' but I really don't see that as an improvement. Why is 'colloidal crystallization in free-fall' preferable over 'colloidal crystallization in a microgravity environment' ? It's both more correct and 16 letters shorter, as well as being more accessible language. I can't force anyone to do anything, but it's strange that someone would prefer to use more letters to be less clear, accurate and general. Yes , in a sealed capsule, you couldn't tell the difference between free fall and a microgravity environment. You also couldn't tell if you were in close orbit around a neutron star, where the magnitude of g could be many times that on earth. So free fall also emulates a megagravitational environment. In other words, the magnitude of g is totally irrelevant, and therefore meaningless when it comes to understanding what's happening in free fall. If you say free fall lets you simulate what it's like to be in an inertial frame in a part of the universe where g is small, it also simulates what it's like to be in orbit in a place where g is very, very large. Free fall is free fall, no matter where you are, that's what makes it such a powerful and useful concept. The NASA mythology of microgravity? Not so much. Ummm, no. It's not faked. You can look up in the sky and see it pass by sometimes. Clearly you never heard of Einstein or General Relativity. Google "Einstein's happiest thought" - when he realized that in freefall gravity actually does disappear. That's not the same as microgravity. You use the word "freefall", and Einstein essentially did the same, saying -- "The gravitational field has only a relative existence... Because for an observer *freely falling* from the roof of a house - at least in his immediate surroundings - there exists no gravitational field." So there is gravity, and there is free fall. NASA's "microgravity" still doesn't make an iota of sense. I don't like the term, I prefer the old zero gravity. But I have enough sense to know it's not a metric system definition - a microscope doesn't have to magnify a million times, micro in this context just means really small. They changed it from zero because little things like tidal effects, thin but non-zero air friction and vibrations in anything bolted to the station make the floating imperfect. Really small still doesn't make sense. It's either zero, if you take Einstein's happy thought to heart, or substantial if you accept that it's gravity that's causing you to stay in orbit. Besides, while Einstein's insight makes sense because you can't tell from a local experiment that you're in orbit around the Earth, if you look out the window you can see that you are moving around a massive planet. It's not hard to estimate the magnitude of the gravity that's accelerating you (and everything around you) with a few naked eye observations and a pencil. It will not be micro in any sense, if you're aboard the ISS. I shouldn't have bothered trying to explain things to a guy that thinks he is smarter than all of NASA's engineers. i) As you say yourself, you can't tell from a local experiment that you're in orbit around the Earth. That is actually the final argument. Your experiment should be ignorant to whatever the investigator sees when looking out of the window. ii) It is actually impossible to estimate the magnitude of the gravity that's accelerating you with a few naked eye observations and a pencil. You must not only consider the graviational pull of Earth, but also increasing forces exerted by the sun, the milky way, and so on. What you propose in your argument is a more or less random observer based reference frame, which is not forbidden, but unpractical, as the reference frame (and the forces experienced within) of the experiment will determine its physics. However, to refer to your own argument again, you can't tell from a local experiment that you're in orbit around the Earth. In contrast the term microgravity is surprisingly honest, as it implies that experiments are not performed in a totally ideal inertial system, but some external accelerations are still present, which are however much smaller, then we earth-bound people are used to. Especially with systems as in collodial crystallization, such small inequalities can still have an effect. Yes you can estimate the gravitational acceleration with a pencil and a few naked eye observations. It's an easy calculation that I will be happy to post this Friday. If the external accelerations you're talking about include things like drag, they have nothing to do with gravity. With makes microgravity even stupider. Pixel guy, you think the engineers came up with the idiotic term 'microgravity?' I would have guessed it was a PR flack. Did you post your "calculation with a pencil" already? Have you meant your article from Sept. 4th? I haven't found any other. You caught me. Not that I can't do it, just that other things got in the way. I'll get on it as soon as I can. As others have pointed out, general relativity changes the way we think about gravity. The emphasis is on the word "relativity". You're thinking in terms of a reference frame tied to the Earth. However, from a general relativity perspective, an observer in orbit around the Earth, i.e. in free fall, finds themselves traveling through spacetime that's locally very flat. In general relativity, "gravity" is a name for the effects of spacetime curvature. If the spacetime in your reference frame is flat, it's equivalent to saying it has no gravity. Of course, you can always change your reference frame and find that there's spacetime curvature anywhere in the observable universe - not just from the Earth, but from the Sun, Jupiter, Saturn, the Milky Way, the Local Group, etc. So in that sense, there's always spacetime curvature present at some scale, even if your local spacetime is flat. But the force of gravity is an effect that only shows up when you're not following the curvature of spacetime, i.e. not in free fall. In an orbiting reference frame, that effect is minimal, hence microgravity. In general relativity, both the centrifugal force *and* the force of gravity are considered fictitious forces - forces that only arise in reference frames that are non-inertial, i.e. not free-falling. Significant gravitational forces nor centrifugal forces don't exist in an orbiting reference frame, from the perspective of general relativity. It's not that they cancel each other out, it's that a different perspective is being used, one in which those forces don't exist in the first place. It's important to note that these ideas are entirely dependent on the model you're using. You can "translate" from a Newtonian perspective to a GR perspective, but you can't take concepts from one model and use them in the other model without translation. In the GR model, in the orbiting case, there's no gravitational force and centrifugal force canceling out - there can't be, because the orbiting object is in free fall, and it makes no sense for it to be experiencing such forces - even though in the Newtonian model, it does. Still nothing is "micro" about microgravity (if it was, then you should be able to provide some way to measure it to show that you're not actually in milligravity). And being in free fall is also following the curvature of spacetime. "Microgravity" is nonsensical and misleading jargon. "Free fall" is clear, simple, and correct when people are experiencing what NASA likes to call microgravity. I'm not sure what it means to say "the force of gravity is an effect that only shows up when you're not following the curvature of spacetime." A force is something that causes acceleration. So you can know the magnitude of a force provided you know the mass of the an object and its acceleration. The ISS must be accelerating to follow a curved orbit, and it's also massive, so it's clearly experiencing a substantial force. What is that force? Gravity. How is it "micro" if it is substantial (i.e. about 80% of g)? > "Still nothing is "micro" about microgravity (if it was, then you should be able to provide some way to measure it to show that you're not actually in milligravity)." The most basic reason that gravity in the orbital environment is referred to as "microgravity" is because that's what instruments actually measure - accelerations of millionths of a g.
> "And being in free fall is also following the curvature of spacetime." Yes, but free-falling has the effect of making spacetime appear flat in the free-falling reference frame, so that the only residual gravitational forces that are detectable are millionths of those found on Earth, i.e. microgravity. > "I'm not sure what it means to say "the force of gravity is an effect that only shows up when you're not following the curvature of spacetime." > "A force is something that causes acceleration." For gravity in GR, this only occurs in a non-inertial reference frame. See the above link. > "So you can know the magnitude of a force provided you know the mass of the an object and its acceleration. The ISS must be accelerating to follow a curved orbit, and it's also massive, so it's clearly experiencing a substantial force. What is that force? Gravity. How is it "micro" if it is substantial (i.e. about 80% of g)?" You say "it's clearly experiencing a substantial force", but in the GR model, this incorrect. The ISS is in free-falling inertial motion, which corresponds to following a geodesic through spacetime. As such, there are no significant forces acting on it! This is a change in GR vs. classical physics. As such, in the inertial rest frame of the ISS, the "forces" due to gravity are minimal - millionths of a g. And this is indeed what measurement devices show, as NASA has demonstrated. I totally agree with the Buzz. I think the the correct term is micro normal force. Normal force is what we feel on Earth. G-force is the value of normal force at the Earth's surface. On the ISS, where there is hardly any normal force it was called micro g-force. This got shortened to micro g, and then somehow became microgravity. As clearly stated, gravity at ISS distance is 90% of earth's surface gravity and therefore, if anything, macro gravity. What's different is the normal force. It is hardly there and I think the best way to describe it, as the lack of normal force is what the experiments are all about. Normal force is easily explained to someone unfamiliar with the term, just ask the person while sitting or standing to imagine all the parts of their body in contact with the chair/floor and feel those body parts being pushed up and pressed upon by the objects. It viscerally makes you realize how strong the normal force is. Hey Buzz Skyline, thanks from Brazil. Buzz, here's an example of how Microgravity has become an authentic liability. About three weeks ago I paid a visit to Huntsville's U.S. Space and Rocket Center. All was well until I attended a docent-led tour of the Center's mockup of the International Space Station. The Docent explained that, “On Earth the ISS weighs about one million pounds. Where it is now it weighs about one pound. This is because of microgravity”. The Docent says it's one pound, the Manager of Museum Operations defends it, and the CEO apparently sees no need to get in on it. The guests at a major museum of space exploration are all being told that the ISS weighs one pound at only 250 miles above Sea Level. Microgravity is a destructive word. Wow. That's crazy. And sad. And, unfortunately, all too common. I have to un-teach my own kids about microgravity periodically. Thanks for the anecdote. Please let us know if you hear back from the CEO.